Superheroes and horror movies continue to rule the box office. That's not changing until... Detective Pikachu. 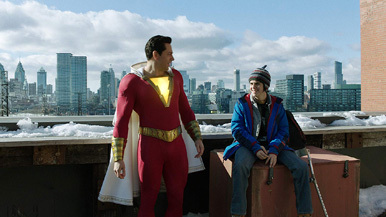 Our top movie yesterday was the delightful Shazam!, a DC movie with a ton of heart. Featuring Zachary Levi (Chuck, Tangled, and various Thor films) and a cast of talented teen and pre-teen performers, it has cross-demographic appeal and stellar reviews that have encouraged audiences to go ahead and head to theaters for a good time. A $5.9 million total from its Thursday previews gave it a great start, leading to a $20.5 million Friday (those Thursday numbers roll into the Friday total). I see no reason the studio won't estimate it at $50 million, even if it falls a bit short. With a 91 percent Rotten Tomatoes score and an A Cinemascore, this one should perform well right up until the point that Avengers: Endgame is released. Pet Sematary, a remake of the 1980s film based on Stephen King's scary book, earned a solid $10 million yesterday, including $2.3 million from its Thursday previews. It has okay reviews for horror (62 percent fresh at Rotten Tomatoes), but a C+ Cinemascore. The name recognition and a scary-as-heck trailer should be plenty for around $22 million this weekend, but the subject matter is pretty tough for people who might have enjoyed the story the first time around. I'm pretty sure I'll never see this one.